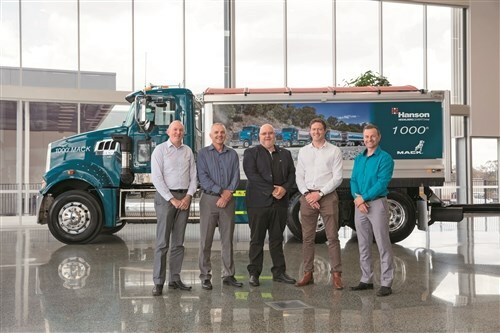 Construction giant Hanson has taken the keys to its 1,000th Mack truck, marking a true-blue partnership spanning 34 years. The symbolic Mack Trident tipper was presented to Hanson in the swish new Volvo Group Australia (VGA) showroom in Brisbane on September 17, sporting millennial livery and personalised ‘HANSON’ plates. Hanson’s general manager of logistics Scott Tipping took the keys to the truck, celebrating a long-standing relationship and a shared future safety focus between the two companies. "Hanson purchased its first Mack in 1984 and we've had a history ever since," Tipping says. "I think it's a really symbolic thing we've been doing business with Mack for so long." 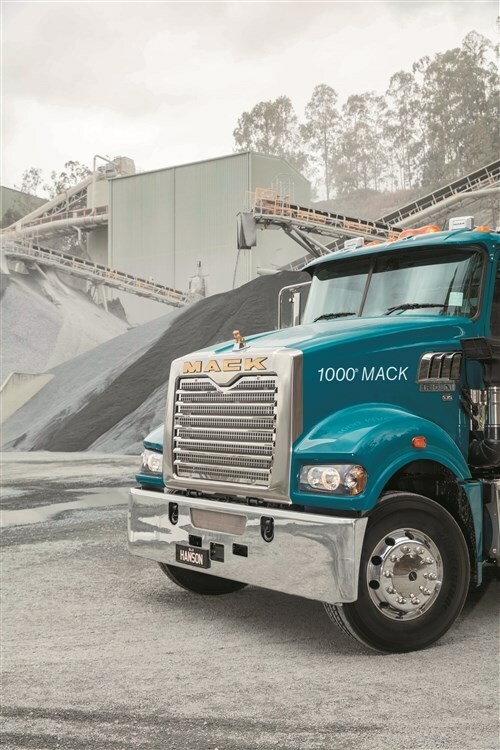 Mack Trucks vice president Dean Bestwick reiterated just how proud the manufacturer is delivering the best truck for the job, a key reason Hanson has chosen the brand for so many years. "I feel very proud that Hanson has teamed up with us to deliver this amount of trucks as we look to deliver the product that can make them the most money and be the safest on the road," he says. "We do it because we have a passion for it." Hanson is one of the largest construction material suppliers in Australia, operating 55 quarries, more than 225 concrete plants, and 1,750 trucks completing a gargantuan 70,000 deliveries each month. Tipping says reliability is vital to meeting its transport demands across the fleet. "Without tippers and tankers our business grinds to a halt," he says. "Mack Truck gives us what we need in terms of making sure we can service our customers across the country. 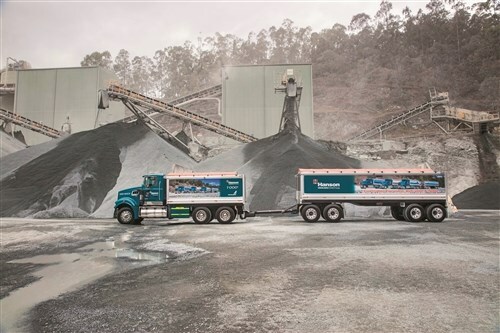 "We're able to deliver literally tens of thousands of tonnes a day across Australia on the back of our tipper fleet." Mack Trucks area fleet manager Luke Barnes says the key to ensuring reliability is utilising VGA’s extensive dealer network to keep the wheels turning for customers like Hanson. "One of the biggest things with Hanson, who are our biggest customer in terms of volume, is being able to keep their trucks on the road," he says. "It’s one thing to take an order for 100 trucks, but it’s another thing to keep them on the road out there in the field. "One of the key things for that is making sure our dealer network supports the customer as well as what we do from a head office perspective here." A focus for Hanson is safety and Tipping says he believes autonomous driving aids are the future of road transport. "I see technology, particularly stuff like autonomous driving aids and semi-autonomous driving aids, as a real key," he says. "For me it's the way the industry should be going and our recent commitment to having those types of features on our tippers and tankers is really about us ensuring that our drivers on the road have the best gear available to ensure their safety and the safety of other road users." Barnes says Hanson is now a leader in the safety space and having trucks fitted with technology smarts like Bendix Wingman Fusion, blind-spot alert, and adaptive cruise control with braking, the company has been able to reduce the risk of accidents (see breakout box). "The next era for Hanson is to move into more of the safety side of things … Hanson were the first to come to us to say, ‘look, what can we do in terms of safety in the trucks, not just for road users but our drivers too?’" he says. "We have the full Mack ‘safety pack’ on all of Hanson’s new trucks, which features Bendix Wingman Fusion, blind-spot alert, adaptive cruise control with braking, those sorts of things. "We’ve also coupled that with side underrun protection system (SUPS) on the side of the vehicles now … 100 per cent of their new vehicles will be equipped with SUPS and full Mack safety pack. 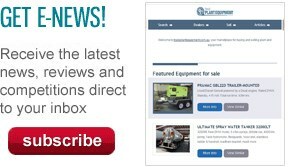 "To have a construction company come to us wanting full safety features on their trucks is really exciting for the industry. We definitely see them as leaders in that area." While Hanson order heavily automated trucks now, Barnes talks of one of the defining moments when the company first started ordering mDrive automated manual transmissions (AMT) as standard after many years of ‘manual-only’ orders. "When we first had the mDrive hit the scene, Hanson weren’t really up to take on automated transmissions at the time," he says. "Out of an order of about 80 trucks I think they wanted two, and I delivered a few more than two just to show that this thing is really good. "From then, their next order was 100 per cent mDrive." Feedback on the Mack safety features from Hanson’s drivers has been extremely positive and while some were originally uncertain, Tipping says that once drivers have spent time using the technology they come around. "The feedback from our drivers in relation to any safety devices we put on is good," he says. "Some drivers are a bit sceptical about whether or not those features are necessary and people naturally think they can do a better job. "I think most of our drivers who have worked with the technology and played around with the technology, do see the benefits from it." A game-changer for Hanson’s on-highway trucks, according to the drivers, is the adaptive cruise control alongside the collision mitigation safety features. "The adaptive cruise control is a big one for us," Tipping says. "The feedback we receive from drivers about active cruise control and autonomous emergency braking has been really good." Mack’s position as one of the safest conventional trucks on the market makes the brand a logical choice for Hanson, keeping drivers safe with industry-leading safety technologies, coupled with their inherent safety features. "If we’re creating a safe environment for drivers and we know that they can come home safely to their family at night, there's no greater satisfaction," Bestwick says. The 1,000th Mack for Hanson also features a gold bulldog up front, which means it houses a full proprietary driveline from front to back. "The gold dog on the front gives you the full Mack driveline … it means everything is synchronised, so the engine, the transmission, the driveline, the diffs, the suspension – it all works together," Bestwick says. "When you want a fully synchronised driveline you run a gold bulldog and at the moment we have a higher ratio of those gold bulldogs coming off the line, which makes our guys very proud." The driver jumping into the 1,000th Trident was long-time Hanson employee Jason Burrow, who started with the company as a sub-contractor in a Mack of his own more than a decade ago. "In 2007 I bought my own truck and dog and I was a subby for Hanson for nine years," Burrow says. "I decided to get out of that and was offered a job here as a company driver and I’ve been here ever since!" Owner//Driver visited the Wolffdene Quarry in Brisbane where Burrow was visibly excited before jumping into the new rig, taking the keys to the flashiest truck on site sporting unique ‘1,000th Mack’ livery. "The 1,000th Mack truck for Hanson, it’s a pretty special truck. It’s a bit of an honour to say I can take the keys to it," he says. "I think it’s going to open a few eyes, get a few looks, it looks pretty sharp!" The truck is destined for a tough life, loaded to capacity each and every day, on mixed terrain across south-east Queensland. "That truck will start its life in south-east Queensland and it will run between our quarries here and our concrete plants," Tipping says. "That quarry environment is a tough game and we are loading the trucks to maximum payload most of the time. "So really there is no natural home for our trucks – any day depending on where our customer is our trucks could end up driving on anything and being absolutely anywhere." Unique livery makes this Mack a show'er as well as a go'er! 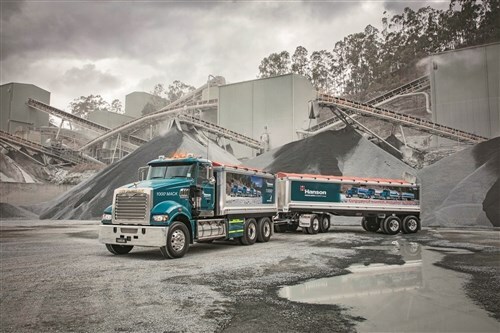 Hanson’s confidence in the Mack product is evident when you look at its order book, with 45 agitators and more than 100 truck and dogs with the full safety package due to be delivered between now and the first quarter of 2019. "For us the Mack in terms of the capital cost up front and tare weight certainly comes out on top," Tipping says. "Supporting local manufacturers is a really good thing and I think the ability for us to customise our purchases and make sure we are getting the most productive trucks on the road by playing with things like axle spacings is important." With the Hanson orders due to be delivered across Australia, all fitted with the full range of safety technology, the Mack production facility is hard at work. "We're pretty busy at the moment, we are pumping the trucks out and it's going to be one of our biggest years ever in 2018," Bestwick says. "I think what we're delivering to the market right now is the best that I've seen in a generation since I've been with Mack."